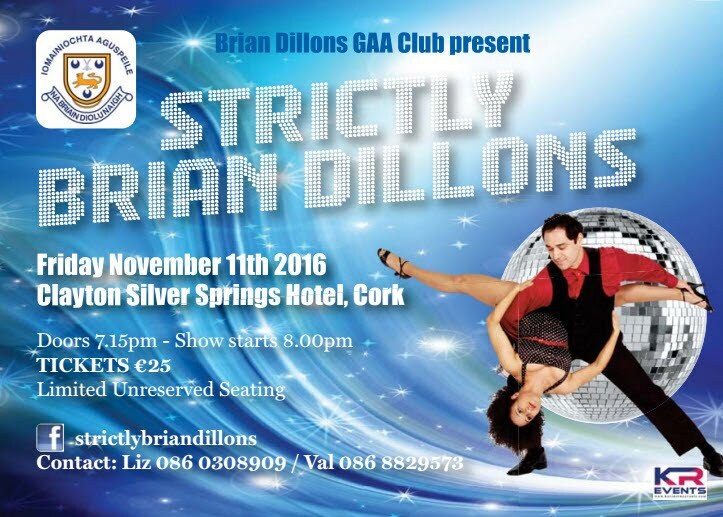 Congratulations to all involved in our recent Strictly Brian Dillons night, the night was a fabulous success and credit to all involved. A big thank you goes to all our dancers, organizers, audience and those who helped out in any way. Below are some photos from the night. Don’t forget Brian Dillons Juvenile Academy Registration Day this Saturday at 11am. Registration is only €40 for the year (€25 for second and subsequent child) and each boy registering will receive a free club training top. There will be refreshments for parents and kids and the club shop will also be open selling club gear and equipment. We look forward to seeing all our players and hopefully some new and returning players on the day. Please like and share as much as you can! A. Glen Rovers v Na Piarsaigh. B. St. Vincents or Whitechurch v Blackrock. Winner of A v Passage. Winner of B or Blackrock v Nemo Rangers. Junior (A) Football Championship Replay Scheduled for Tomorrow (Friday) Evening. The Brian Dillons Junior (A) Footballers will meet Whites Cross in the City Division Junior (A) Football Championship First Round Replay on tomorrow (Friday) evening, 8th May,2015,out in Ballinlough ,with a 7.00pm throw-in. In the event of another draw, extra time will be played. In last Saturdays thrilling drawn game, Brian Dillons will feel they left it behind, as they held a two point lead ,with the game entering stoppage time.. However, Whites Cross, who looked likely winners, earlier on, slipped over two late points to send the game to a replay. Another thrilling encounter is anticipated ,tomorrow evening. Best of luck to the Brian Dillons players and to Manager ,Chris Daly and his Management team..